I do not have another snow scene for you today but my pointsettia does feature masking fluid “snowflecks”. I used a watercolour block for this panel and flicked masking fluid over it with a tooth brush. I used distress stains for the first time along with some memento greens. The pointsettia is stamped with Barn Door distress stain. The impression was pale and incomplete at the tips of a few petals which was perfect for what I planned to do. The stamped image was my guide for watercolouring but I didn’t want it the outline to dominate. As I wanted to paint with the distress stains I pressed the bottle’s sponge top down several times onto an acrylic block which I was using as a palette then picked up the ink with a paintbrush. I painted the lower petals with barely diluted stain and the top petals with a blend of water and stain. After I had painted them all red I realised I wanted some green outer ones so I stamped one lightly with memento pear tart ink and drew the others with a pear tart marker. I added brown ink to the areas I wanted to be shadowed and used a marker to redefine the centre of the flower. To create a background I painted water around the poinsettia then painted Broken China stain into the wet areas. The card is 5.5″ x 5.25″. It is just beautiful, Heather, as usual totally inspiring. I just went back through your tutorial list and refreshed my mind with the techniques and touches you have presented. Being a visual learner, I gain so much seeing your steps! Thank you so very much for all your work, your “mistakes” and “saves!” and sharing your inspiration with all of us! HEATHER, I love the technique you used. I have never used masking fluid, but I like how it turned out here. Adding the green petals was a great idea because it set the card off BEAUTIFULLY. Very nice work. i hope you come back to angelas next year as I missed your classes last year. or maybe you could just come to my house!! aack. this is gorgeous. gorgeous!!!! Another beauty. I live using distress products this way. Thanks for sharing ! This is a true work of art! I love how you experiment and go with it! You do beautiful works of art! Beautiful – a work of art. This is absolutely gorgeous! I love the colours and the look you achieved by not having the outline dominate. This card is absolutely gorgeous! I’ve never had much luck doing watercolor but you have mastered it! You really are an artist! This is simply stunning! You are such a master at this. Thank you for sharing. I’m new to your blog and boy, I sure have been missing out!!! You are very talented as seen here with this poinsetta. I believe this would fit well in any gallery in NY. Very Monet-ish. Another wow, Heather! I hadn’t thought to try using distress stain to watercolour, but I do love my distress markers for watercolouring. 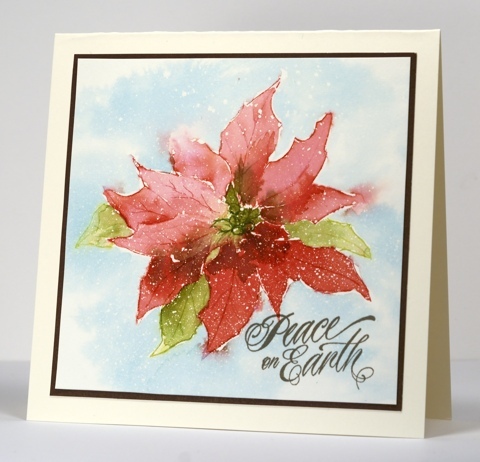 And such a lovely poinsettia stamp. This is just really gorgeous Heather. Love you how colored this poinsettia – so soft and lovely.